Hawick endured a difficult Five Star Taxi’s Gala sevens last weekend but, according to club captain Bruce McNeil, the performance wasn’t unexpected as the Robbie Dyes pay little attention to the King of the Sevens series with a much bigger, and potentially club-defining, contest looming. A heavy 47-5 opening round defeat to Watsonians was followed up by an improved 19-17 victory over Peebles that set-up a bowl semi-final match-up against Boroughmuir, which the Edinburgh side eventually took 26-16. It was an up-and-down afternoon for the Greens, who collected three points towards the King’s tournament standings for their efforts, but McNeil wasn’t surprised with the results with such an important game against Edinburgh Accies less than a month away. “The results were a mixed bag really, nothing to shout home about performance or results-wise, but it wasn’t like they weren’t expected,” said McNeil. “Watsonians were outstanding, totally dominant and looked like a team who have been training for sevens rugby, we haven’t. After a punishing seven tries to one defeat to eventual tournament winners Watsonians, Hawick made amends with a compact, error-free and smart three tries to two triumph over Peebles that earned a bowl semi-final place against Boroughmuir. The third competitive game, however, proved to be a step too far for the Greens as Boroughmuir took advantage of Hawick’s tired legs, dispatching the Mansfield Park outfit before defeating Gala in the final to lift the bowl title. 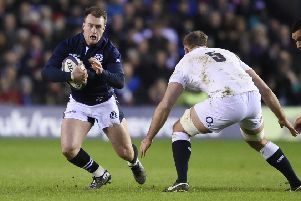 “Overall, it wasn’t the best performance but it was nonetheless a good run out after a month of no real competitive rugby,” continued McNeil.